One week ago, the Raconteurs announced that they were rush releasing their new album in order to “get this record to fans, the press, radio, etc., all at the EXACT SAME TIME so that no one has an upper hand on anyone else regarding its availability, reception or perception.” Yesterday, in equally democratic fashion, Glorious Noise announced a contest wherein we would publish the first review submitted to us by you, our readers. Kiko Jones earned that honor. Post your own review the comments! These guys are old school. Yeah, how to boil water and all that. But who puts a lead off title track on their album anymore? And a worthy one, too? This one prominently features the lead vocals of Brendan Benson in what seems like a deliberate attempt to once again assert the “we’re a band” concept and not the commonly held “Jack White and co.” perception. Wait—seems? Nah, Jack White chances nothing. In any event, once revved up, Consolers of the Lonely rocks a bit harder than Broken Boy Soldiers (“Salute Your Solution”; “Hold Up”; “Five on the Five”; the title track) and has a more in-your-face mix than their debut. The band even dabbles in retro R&B balladry—”Many Shades of Black”, complete with the requisite horn section, in this case the legendary Memphis Horns—and pseudo-White Stripes territory on the bluesy, slide guitar-flavored “Top Yourself”—but there’s nothing here to win you over if you weren’t sucked in the first time around. Conversely, if you felt Broken Boy Soldiers answered the question, “what would the White Stripes sound like with a rhythm section carried by a real drummer?” then this record is for you. Even though we are only a third of the way in, arguably the most anticipated rock record of 2008 is here and it’s pretty good. Which in this era of increasingly diminishing returns is about par for the course. However, don’t let that diminish your enjoyment of Consolers of the Lonely one bit. This ain’t no sophomore slump, not by a long shot. Kiko Jones is a Glorious Noise reader (and contest winner!) who runs 5, THE music and pop-culture e-newsletter-turned-blog, baby. This band is just shockingly dull. It looks great on paper but just doesn’t work. I still care about what Jack does and love both Brendan and the Greenhornes. I just can’t believe how boring and lame these two records are. I didn’t even download them for free. I will agree that this feels more like rock and less like pop, partially attributable to the diminished prominence of mr Benson. I actually have really been digging it – so much that I bought the real thing and deleted the compressed and tinny leak. Jack’s newish fascination with country is also quite evident. Five on the Five used to be played live a lot, and it’s awesome on the record. I don’t know how new Jack’s interest in country is…he was the drummer for Goober and the Peas, for heaven’s sake! 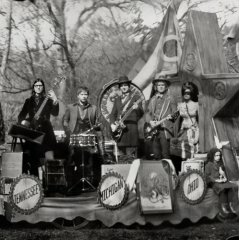 I said “new-ish”… what I meant was there’s definitely a country vibe that’s new to the Raconteurs and has been slowly creeping into the WS records. Anyway, it only applies to a couple of tracks, like Old Enough and Pull This Blanket Off. Even then, upon further listening, it’s more Southern Rock than Country. I’m getting an Exile vibe, but then the album is all over the place and it kind of depnds on what song I start on. Agreed, Jake. The first album sounded more like a collaborative effort than this one. I’m not bummed but after repeated listens, I do find myself gravitating more and more towards the tunes with a power pop vibe to ’em. Maybe Jack is looking at The Raconteurs as his main vehicle, ever since Meg opted out of touring last time. Anyway, I’m digging this album and looking forward to seeing them live.